Phosphene Dream is the third release by the Texas-based Black Angels, and it is their masterpiece. Released on the Blue Horizon label in September 2010, it conveys the dark, less innocent side of the Sixties and hippiedom. Without a doubt, this is the side that Scott McKenzie couldn’t even conceive of when he sang the song San Francisco. Songs from the band’s Directions To See A Ghost CD were featured in the History Channel’s documentary about Charles Manson (called simply Manson). It's about as terminal as the Sixties could get. The songs on Phosphene Dream bring together bits of influences from Jesus and Mary Chain, Blue Cheer, Roky Erickson (Black Angels served as his backing band in 2008), and the Velvet Underground. The latter is responsible for The Black Angel’s Death Song, which is where the band takes its name. The CD's title is fitting; phosphene is the phenomenon of seeing light without the light ever entering the eye. But what makes it a truly remarkable showing is the distinct psychedelia. It's dark, textured, and retro. Sunday Afternoon also owes a nod (a tribute, perhaps) to Erickson’s 13th Floor Elevators. Yellow Elevator #2 has some Beatles influence, but not in the way the Beatles might have liked. And Haunting at 1300 McKinley is ethereal and downright ghostly. Hell, if you listen closely, there’s even a bit of the Monkees, somewhat darkly, inside. But what really makes the sound stand out over the previous two releases — Passover and Directions To See A Ghost — is less heavy jam sessions. It works to the band's advantage, enabling the group to focus on strong rhythms, reverb-heavy guitars, and trippy, dreamland vocals. The Black Angels got it right this time. And the credit belongs singer Alex Maas (also bass, guitar, and keyboards; Nate Ryan (bass, guitar, and drums); Stephanie Bailey (drums, percussion, and bass); Kyle Hunt (keyboards, percussion, bass, and guitar); and Christian Bland (guitar, bass and drums). All strong strong musicians with a dark, shadowy vision. The Black Angels’ Phosphene Dream Ascends To 8.8 On The Liquid Hip Richter Scale. It's no surprise that previous touring partners have included The Black Keys, Black Rebel Motorcycle Club, Raveonettes, and the great Roky Erickson. 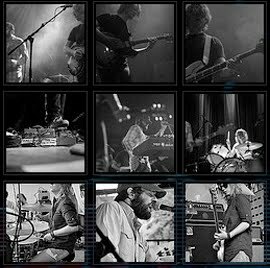 Currently, The Black Angels are spreading their brand of love through the United States. Make it live. Phosphene Dream by The Black Angels is on iTunes. You can find Phosphene Dream on Amazon, and a slightly different Phosphene Dream [Exclusive Version].